HK Tai San Guesthouse was from a friend suggestion, they’ve been in Hong Kong a couple of months prior to our trip. That friend mentioned this hotel to be situated nicely near the TST MTR station, has an affordable rate that suits for budget travelers, clean room and nice attendants which happens to be a Filipina on the branch where they stayed – Burlington Branch. I initially look at tripadvisor and some blogs for review and found out that most are really good feedbacks. So I called them only to know that the specific branch I am aiming in Burlington was already fully booked. It didn’t surprised me much as I was already warned about this, good thing Ken, (I guess he was the owner) provided me an alternative. He mentioned that they have an available unit for four at their Harilela Mansion Branch it’s just that we need to transfer to another room for our last night accommodation. The second room is right at the same level of the same building so I agreed to his offer. I booked for three nights and four days. We spent the first two nights in a room for four with two double beds and an in suite toilet and shower. Then the last night at two double rooms which also have its own in suite toilet and shower. We paid for the required deposit via Paypal and printed the email confirmation and sent it to the owner. Ken then replied confirming our booking. From the airport we took a bus going to TST bus stop, we cross the road and in two minutes we were there (or we are supposedly there since we lost our way first due to confusions in google map). Anyhow, this is the room that welcomed us, a basic, clean and pleasant room. The caretaker of Tai San Guest House Harilela is an Indonesian, Ate Yolly at their Burlington branch is the Filipina whom I get to speak with via viber. Both of them were kind and helpful. HK Tai San Guesthouse at Harilela Mansion made our Hong Kong stay easy and wonderful, it is economic, accessible and a pleasant stay. We never had any troubles with this guesthouse and never had a single regrets hence I am suggesting this as a good option if ever you’re looking for one in Hong Kong. It’s a really cute home away from home. 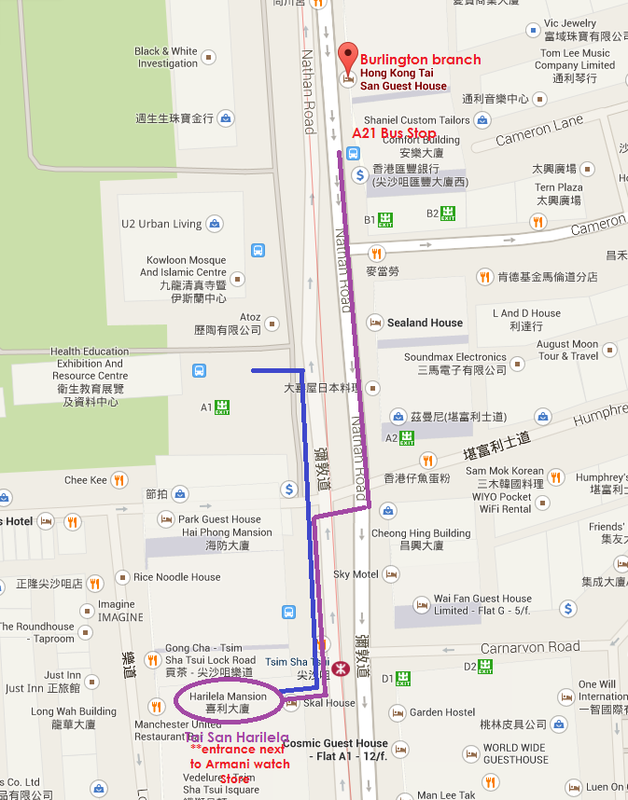 While there are two Harilela building in Tsim Sha Tsui - Harilela Hotel near Ashley Road and Harilela Mansion. Tai San Guest house is located in Harilela Mansion with a small entrance along Nathan road. Your may utilize the map below. The other lift - the one in the right side, since there were only two, is a service elevator. The walls are firewood that is seemed to be poorly built, but we rode in it many times and it’s working well. If you are not comfortable with the look, take the lift in the left side. The room size is not that big, just enough for you to have your own space and an extra for your luggage. Base on some reading this is common to any Hong Kong accommodation unless otherwise you book for high-priced hotel rooms. The second room we had on our last night has a very tiny toilet and bath, good thing were petit or else it would surely be hard for us to move around while taking a bath. We didn’t find this a guesthouse disadvantage though, because according to some friends small T&B are common in Hong Kong. Some even said that most of the cheap accommodation of guesthouses doesn’t have an in-suite T&B – remember that when looking for a place to stay in Hong Kong. >>> Hong Kong - Macau Itinerary, Expense, Travel Guide and Personal Notes. I'll keep this guesthouse in mind if ever I get to Hong Kong. Good day. Do you still have the number of Ate Yolly? I just want to talk to her via viber. Thanks. Do you still have the number of Ate Yolly? I just want to talk to her via viber. Thanks. Do you still have the number of Ate Yolly? Hi, how much was the acoomodation at the guesthouse? Hi. What if i don't have credit card. How can i stay there? you can contact ate Yolly at the Burlington branch. money transfer is an option. Hi, this blog of your is a big help to travelers who are new to the place..would the HK immigration be asking for the hotel booking document or they would just ask you where you would stay? Since i have a relatove in HK..
We have our's printed but they din't ask for the document they just ask the address and the duration. I think it is safe to have it handy just encase they would because there are instances that they check the printed booking confirmation. Would the Hk immigration be asking for a hotel booking paper or they would just merely ask you? Hi, we'll be going there this january with my parents. Is the place safe like going in and out of the guest house and accessible ( harilela branch cz no available na sa burlington) lalo na kasi elders kasama ko and okay po ba yung care taker dun? Thanks.